Stock Report: Report on inventory levels. Sales Report: Report on sales. Snapshot: Details all activity across Tessera for a specified date range. Purchase report: If you enter your purchasing prices when you enter stock you can report on them here. 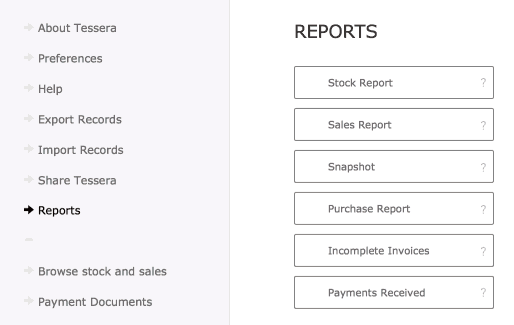 Incomplete Invoices: Report on incomplete invoices and produce statements of account. See the Invoice help files for more details. Payments received: Report on invoice payments made by clients.